Quickly and easily find all the Neverwinter Treasure Map locations with this helpful guide. Here you will find where to dig up those buried treasures. Players can get all kinds of great items from these treasures. These include rare fish, refinement items, relics, rare fishing gear, and fast personal watercraft! It is definitely worth your time hunting these down. Hopefully this guide will help you find these Treasure Map locations easily. I will keep updating it as I get information. Please post any maps or information I am missing so I can make this the most comprehensive Neverwinter Treasure Map location guide possible. A large part of the quests and activity in the Sea of Moving Ice is fishing. There are fishing Heroic Encounters and fishing quests that need to be completed. To fish, all you need is a fishing pole and some bait. You start with worms. However, some of the quests also give out bait. Bait can also be purchased in the campaign store or from the general vendor for silver pieces. Once you have your rod (from starting quests), bait and a boat. Head out into the water and start fishing. If you fish in the fishing hotspots, the glowing rings full of jumping fish and swarming birds, you have a chance to catch a Map in a Bottle. Double click this bottle and it gives you an image to where a buried treasure is hidden. Find that location, dig up the treasure, and enjoy the loot! The trouble is you can only have one map in your inventory at a time. So if you do not know where to go you are stuck without the ability to dig up all that treasure. This is where this guide comes in. It will show you where and how to get these treasures! Here is a great map that just came out with most of the treasure spots on them. 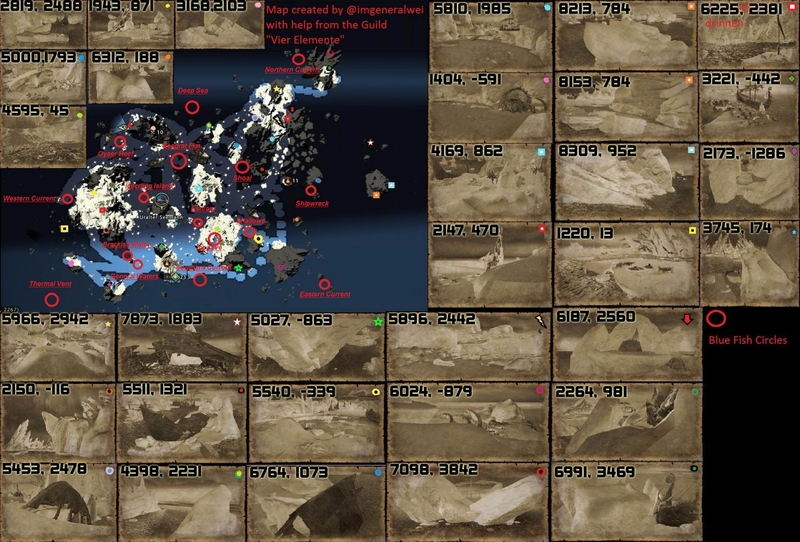 I moved the coordinates on the map so you can see the images better to make it easier to identify which one you have. Thanks to @imgeneralwei and the guild Vier Elemente for their work in compiling these treasure maps locations! To find these locations open your map by pressing M. On the lower left of the map window it will show your current location (loc) numerically. The first number is your left/right/east/west location and the second number is your up/down/north/south direction. The numbers increase as you go up/north or right/east. They go down as your move left/west or down/south. This way you can find out exactly where you are and where those tricky treasures are buried! Please let me know any map locations that are still missing. Images and details on how to get them would be very much appreciated. I will update this guide until we have all of the Neverwinter Treasure Map locations. This way we can all get them fast and easily. Thanks and good luck on loot! I have another map and location screenshot, if you’d like it. How can I get it to you? Thanks! You can send it to me on our Facebook or Twitter accounts or post a link to it somewhere. I have most of them now with the first image with lots on them. I am working on getting videos together to show how to get to some of the tricky ones. Thanks for your help! Keep them coming. GeneralWei’s map was a great resource at when SOMI started, but very quickly I had guild members mentioning that some of the colors and symbols where throwing them off. Because of this I made a numbered map showing exactly where the location is. I then also give descriptions for finding the treasures, and for some of the harder to find maps I give screen pictures on how to get to them. Sure thing! Thanks for the effort to make such a good map. I have a treasure map guide on here as well along with videos on how to get each one. It’s great to have such an active community working together to get this information out to the players! i have a map showing trees as in the River District area ??? This map is probably in the fey area. Look through the fey area ones I have done and match it up. It should show you right where it is. Map is missing the Ocean Trench on the fishing locations. how can obtain all maps, in my bag i have just only one map. 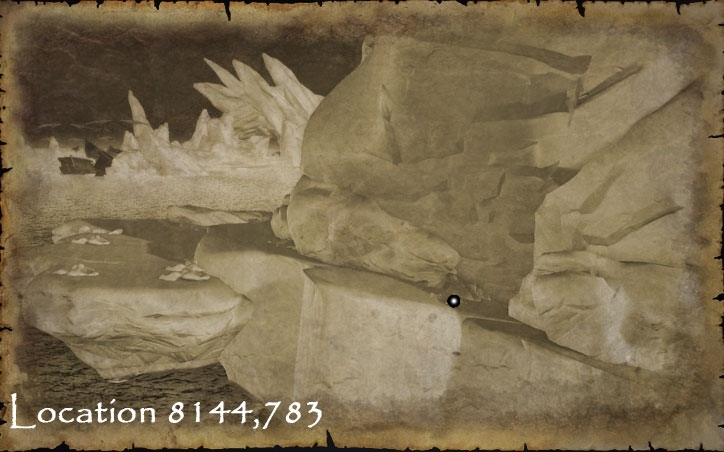 Is it a quest to have another map? For the SOMI Treasure Maps you can only have one MAP in your inventory at a time. You can have a ton of bottles, but no more than one map. So when you have a map. Go find it and dig it up. Then you can open another bottle to look at another map.